You'll be devoting full time to floating, under the sea! 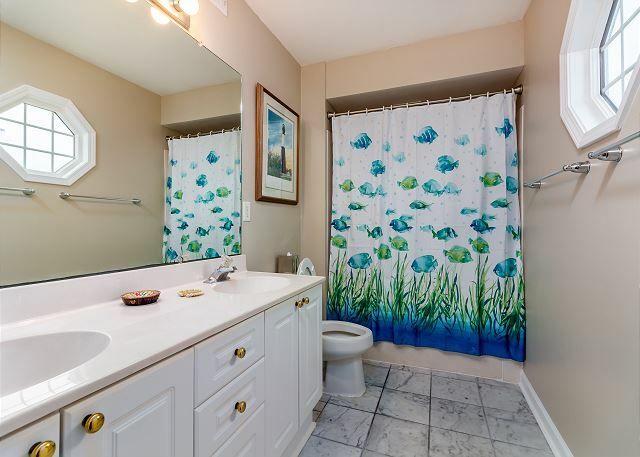 This whimsical three-bedroom, two-bath condo was recently remodeled, and features beachy decor from hanging ten on the waves, to hanging out underneath with a school of tropical fish! The master bedroom has a king-sized bed and en-suite bath, in addition to a floor-to-ceiling sliding-glass door leading out onto the wrap-around balcony. The second and third bedrooms have a queen and two twin beds, respectively, and share the second bathroom. Each bedroom is equipped with its own TV. The fully-equipped kitchen opens into the spacious living area with plenty of cozy seating for the entire family, and the sliding-glass door leading to the wrap around balcony. Though Summerwinds is located behind a townhouse, there is a great partial view of the beach from the balcony. This gated building has easy access to the pools and beach, and is great for a family or group on a budget! Our rental unit Summerwinds #521 was clean and nice. It was a great location. The Beachside Colony property, however, left a bit to be desired. It seemed to be a bit rundown. The pedestrian gate was broken and didn't lock. The pool was dirty and felt like bath water. We had 6 in our unit, but, only provided 5 towels. Two rolls of toilet paper for a full week and six people is not adequate. For the money spent, surely more toilet paper could be provided. The check in staff appeared annoyed at her job. We love it here. Very relaxing and being steps to the beach is what makes it so great. This is our 3rd year in Summer Winds and we look forward to many more memories here on Tybee. Charming beachy decor. Close to the beach with a partial balcony view. Plenty of room for 4 adults and 3 children. Air conditioning went out our first night, and we had to wait until the next day to contact staff, but it was fixed quickly while we waited it out at the pool. We would definitely return to Beachside! We had a great stay at Beachside Colony!!! Very nice and relaxing, rental property was very pleasant indeed. A good choice for a Tybe Island stay. Very nice place to stay. WE will look no further for future trips. With the exception of the rainy weather, the vacation was wonderful. The condo inspired us to look to buy one of our own for future trips to Tybee. Only issue was trying to park in that assigned garage space that is almost impossible with a large SUV given its location to the gate and the tree across from the space. I have stayed at Beachside Colony three times now and this condo in Summer Winds is definitely the best. Great sleeping arrangements and good view. Only problem which wasn't bad was the refrigerator and stove top, needs to be replaced. my family and I enjoyed staying in summerwinds. We ran late on check in day due to traffic and rain along the way. I called Beachside colony and they were so great about explaining and arranging for a late night check in. Everything was just as they said it would be and we had a great vacation. My stay was wonderful. Everything was exactly the way it was suppose to be. Love it . I will definatly stay again and again. We had a fantastic time in this condo by the beach. The bedrooms are lovely and the condo spacious. We enjoyed the well-appointed kitchen; everything we needed was there! The heated pool was perfect as were the comfy loungers beside the pool. We had a terrific time playing on the beach. The only drawback to 521 is the parking. The unit's parking is right next to the gate so it is a tight squeeze if you are in an SUV as we were. Other than that PERFECT!!! Loved being so close to the beach. The condo was very comfortable, clean and quiet. Loved the view. Very good air conditioner. Nice condo, I liked it. Garage stunk, very hard to get in and out of. it was a nice condo, clean and well kept. It was also very large. The unit is one building behind the beach but it is a corner unit with a great balcony that gives you a nice view. We enjoyed our stay at Beachside Colony. The condo was exactly the right size for us and the location was great!! Some of the appliances could use upgrading but other than that it was perfect.I hope to do it again sometime in the near future. One of the better experiences we've had there. Unit 521 has had new paint and decorations added as well as new furniture since the last trip we had there. Truly pleasurable. We were very satisfied with our stay here! We would definitely book this condo again. It was very clean, awesome view, and close to the ocean. a few things could have been a little cleaner. Great first vacation after retirement. My two teenage granddaughters are now insisting that I buy a house just like our rental since they've decided that's where they want to live permanently!! Great vacation. Best Beach Vacation Ever !! This was my family's second year to stay at Beachside Colony and we have been very pleased. We have stayed in a 2 and 3 bed room condo and have already made reservations for a townhouse for a week in 2015. The location is great the staff is very nice and helpful. The unit as always been ready when promised. Both time we stayed our condo was clean and had everything we needed. I would totally recommend anyone to stay her. Review by Julia A. F.
Have been going to Beachside Colony for years. We keep coming back cause we are special here. You have great condos, three pools, a restaurant, the beach and a very family friendly staff. We are somebody here. Wonderful location - pool and beach very convenient. It appeared unit was being updated but did not distract from overall experience. Great location to watch fireworks. Wonderful for family and kids! Six of us, ages 4–66, stayed for five nights. We were very comfortable, the weather cooperated, the beach was just yards away, and good places to eat and explore were abundant. Best of all, the variety of natural and historical sites within easy reach was really excellent for this multi-generational gathering. Best weekend At the Beach EVER!!!! Great place to stay, great view! Would definitely do it again!